Amrita of Eloquence is a luminous portrait of the life of Khenpo Karthar Rinpoche, one of the Kagyu lineage's most beloved and revered teachers. 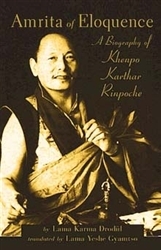 Beautifully written by Lama Karma Drodl (Rinpoche's nephew and disciple) and elegantly translated by Yeshe Gyamtso, Amrita of Eloquence describes Khenpo Rinpoche and his life with humor, lyrical beauty, and boundless affection. Although the book is composed in the traditional style of Tibetan spiritual biographies, it is nonetheless completely accessible to modern readers.